A warm EAPS welcome to postdoctoral associate Xingqian Cui and postdoctoral fellow Daniel Koll. Xingqian Cui works at the intersection of geology with oceanography. 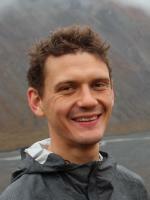 He is particularly interested in understanding the mechanisms and dynamics of organic carbon cycling in fjords through analyses of bulk organic carbon, stable carbon isotopes, radiocarbon, and biomarkers. "Land is connected to the ocean through many rivers," he explains, "which discharge freshwater and transport particles, including organic carbon, to the coastal ocean. Among coastal systems, fjords, glacially carved estuaries located in high latitudes of both the Northern and Southern Hemispheres, are unique. They are characterized by steep vertical gradients from mountain top to deep fjord basins. Because of their relatively young geologic age and deep basins, fjords are sites for net sediment accumulation and thus excellent sites for organic carbon burial." Cui joined EAPS in February to work in Roger Summons' Geobiology and Astrobiology Lab. Cui holds a BS in geology (2011) and an MS in marine geology (2012), both from the Ocean University of China, Qingdao. He joins us from the University of Florida, Gainesville where he completed a PhD in geology in 2016. Daniel Koll is a James S. McDonnell postdoctoral fellow. His particular interest is in the atmospheres of exoplanets and 'exotic' past climates on Earth. Koll seeks to develop theories to help us understand why and how these climates differ from Earth's present-day climate. He is particularly interested in the unusual climates of tidally locked planets, which offer a unique opportunity over the coming few years for testing climate theories against astronomical observations. He is also interested in the dynamics of clouds and convection, and how these dynamics shape the habitability of terrestrial planets. Koll joined Timothy Cronin's Group in February. Koll holds a PhD in Geophysical Sciences from the University of Chicago (2016) and an AB in Physics and Philosophy (minor), Harvard University (2010). He was an Outstanding Student Paper Award Winner in the Planetary Sciences section of the 2016 AGU Fall Meeting for his presentation "Interpreting Atmospheric Circulations of Rocky Exoplanets as Heat Engines."